As our regular customers know, Sonoma Compost has been involved in several research projects in the last few years. Here is a brief overview on two of them. This two-year project was designed to determine if mulch derived from partially composted yard trimmings could successfully reduce soil erosion in hillside vineyards. By the second year, soil loss was reduced by 78% to 98% in mulched vine rows compared to the control vine rows, which received no mulch and had little cover. Composted mulch (product name "Vineyard Mulch") was applied in vinerows planted up and down slopes at four different vineyard sites. A total of three different treatments were utilized. In Treatment One, a 3" layer of mulch was applied the 1st year and a 1.5" layer was applied in the second year. In Treatment Two, a 3" layer was applied in the first year and no additional mulch was applied the second year. Treatment Three was a "control" treatment in which no mulch was applied in either year. At each site, nine contiguous rows were selected for uniformity of slope, soil texture and structure, pore size and percentage of rock fragments. Plots were installed in each vine row and mulch was applied to create three replications of the three treatments in randomized complete block design. Treatments and trial size were identical in all four vineyards. A rainfall simulator was used at one vineyard to allow study of that site's specific episodic response to a simulated rain event, allowing for measurement of erosion and runoff volume. Composted mulch was made from recycled yard trimmings. The material was ground and composted for a minimum of 15 days during which time it was kept at a temperature of at least 131°F, and turned at least five times. This process kills weed seeds and potential disease vectors. The mulch was screened through a 1.5" screen and the moisture content was maintained at 40% -50%. The mulch was applied in the vine rows with tractor pulled mulch spreaders. To insure uniformity inside the plots, the mulch was applied by hand with five-gallon buckets inside the plots to the depth specified. Each site was analyzed using the Revised Universal Soil Loss Equation (RUSLE). RUSLE is a model developed to predict long-term average soil loss. 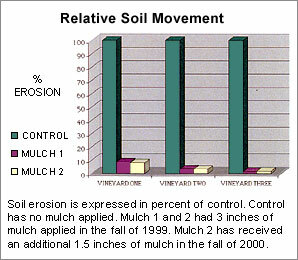 By the second year, soil loss was reduced by 78% to 98% in mulched vine rows versus the control vine rows, which received no mulch and had little cover. For details regarding this project and for an easy-to-use vineyard mulch calculator contact Will Bakx at willbakx@sonomacompost.com The calculator will allow you to determine the exact amount of mulch needed for a given block of vines based upon vine row spacing and the width and depth of the mulch band you wish to apply. Because Sonoma Compost receives organic feedstock from a number of sources we want to insure we don't pass along Sudden Oak Death in materials we sell. Because of our composting experience, we were asked by the Sudden Oak Death Mortality Task Force to cooperate with researchers at U.C. Berkeley in a research project. The project was designed to determine if Phytopthera Ramorum, the pathogen referred to as Sudden Oak Death, could survive the temperatures that occur in properly composted yard trimmings. The thinking was that if the temperatures and microbial action that occur in controlled composting destroyed virtually all other harmful plant pathogens, it should render p. Ramorum harmless as well. We're pleased to report that preliminary data from the research conducted at our facility confirms the results of lab experiments conducted at U.C. Berkeley. 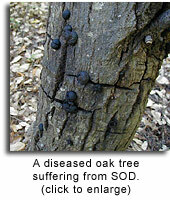 In both cases, indications are that the Sudden Oak Death pathogen does not survive in compost processed according to current state regulations.